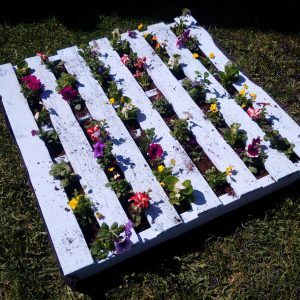 If you’re tight on space outside or just want to try something different – check out pallet gardening. Super easy to do, and you can often find pallets for free or cheap. First step is to find a pallet – try to find the cleanest one you can. Remember to wear some gloves so you don’t get splinters. You can find them at warehouses, job sites or purchase one. Just make sure if you’re grabbing one for free, that it’s really free 🙂 On job sites they often return those for a refund – so either ask, or head to a place that has them marked as free. 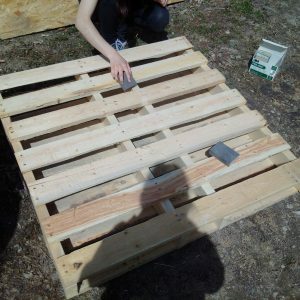 If you check kijiji, there are a ton of ads for free pallets. Once you find one and bring it home, get yourself set up – you’ll have to sand it a bit so it’s safe to plant and move around after. We just did a really quick sand on ours as I don’t plan on moving it around too much. Next step is to paint it, if you want. 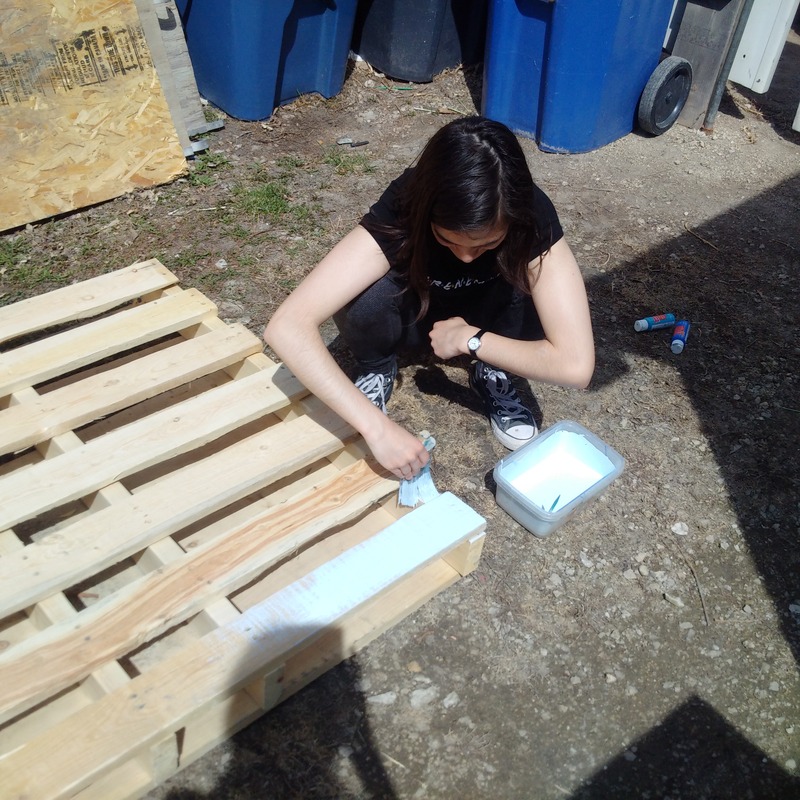 We just used random paints we had leftover – another good idea is to go to your local hardware or paint store and see what they have on clearance or a mistinted kind. You can stain there, or paint them different colours, or make a design etc. After that, you’ll have to staple some landscaping paper to the back – you can pick that up at most stores. If you don’t have a stapler, you can just nail it in. Just keeps the soil in at the back. Go all the way up the sides with it. 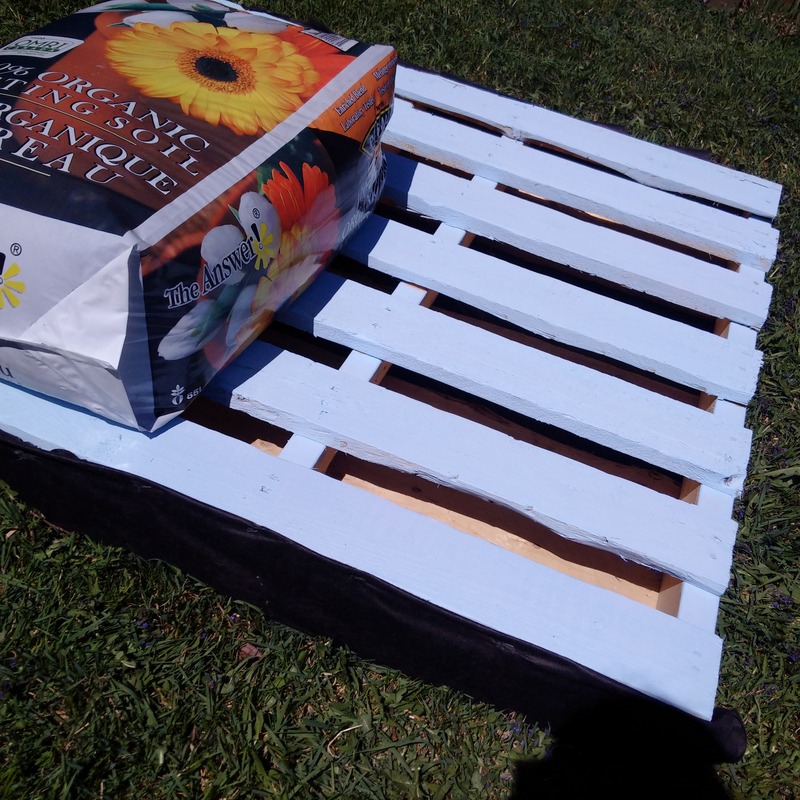 Next, you’re ready to dump in your soil – our pallet used up a 65 litre bag that I got at Costco – that fit it perfectly and was around $10. We went to our local garden store and picked out flowers, I let my daughter pick most of them and we just randomly chose what we thought would look good. It ended up being $25 for the flowers and it could be done a lot cheaper too if you look for a sale, or start them from seed. Amazingly, and I have no idea how but we ended up having exactly enough flowers – we hadn’t planned it out or counted at all. We did each row, 3 then 1 in the center, then 3. And then water – and you’re ready to enjoy it! We did one to start, to see how it would look – and I love it! It’s fun and different – you could easily plant herbs too if you want to be more practical. Even some veggies can grow in that small amount of soil too. Fun idea for small spaces, or if you want to go vertical. it really is – so many fun diy ways to use up pallets.